A boneless pork shoulder is cooked in the slow cooker with sliced onions and a delicious blend of curry powder and other spices. Serve this flavorful slow cooked pork with mashed potatoes and your favorite side vegetable. You can leave the netting on the roast or take it off and tie with twine. Combine the soy sauce, garlic powder, curry powder, ginger, salt, black pepper, cayenne pepper, and 1 tablespoon of the oil. Rub the roast all over with the spice mixture. Put 1 tablespoon of oil in a large skillet and cook the onions over medium-high heat until lightly browned and softened. Remove and set aside. Sear the roast in the pan on all sides, about 7 to 10 minutes in all. 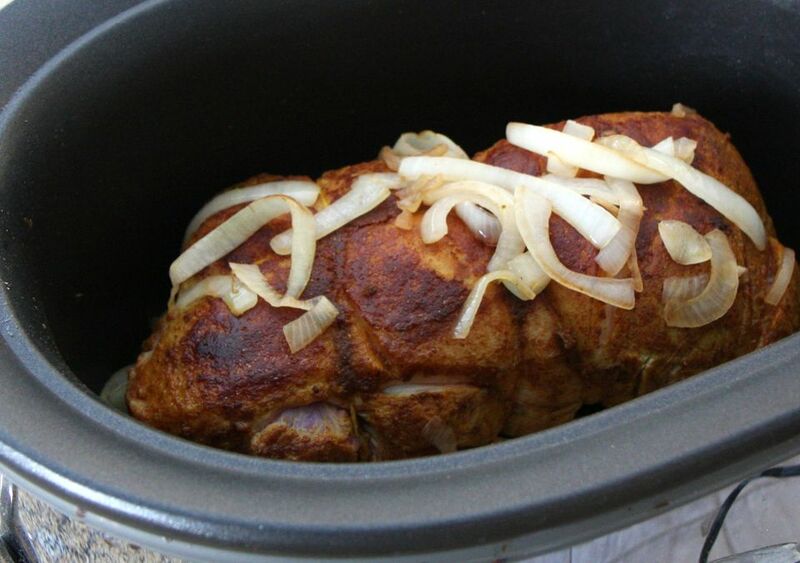 Put the pork roast in a 4 to 6-quart slow cooker along with the onions. Cover and cook on low for about 8 hours, until very tender.